A sharper-than-expected fall in demand from China has intensified the trade recession that took hold late last year. Exporters posted a 9.9 per cent contraction in non-oil domestic exports (Nodx) last month over January last year, adding to the 7.2 per cent decline in December. But the ugliest number was the 25.2 per cent plunge in exports to China - the biggest fall in seven years and a pace not seen since the last recession. Earlier this week, China reported that its imports shrank by 18.8 per cent, a fall far steeper than December's 7.6 per cent contraction. Nodx to all of Singapore's top 10 markets, except the European Union and Malaysia, fell last month. DBS economist Irvin Seah said: "When China sneezes, the whole world catches a cold. But Singapore will probably catch it worse than others because of its small, open economy." Exporters said the decline was not surprising, as global trade has slumped since last year. But in a grim sign that the services sector may be starting to buckle, non-oil re-exports - a proxy for wholesale trade services - plunged 12 per cent last month from a year ago. This marked a sharp reversal from December, when non-oil re-exports grew 0.8 per cent. The services sector had been resilient last year, but economists fear that the sector is starting to feel the knock-on effects from lower industrial activity. The new year has delivered a raft of bad news so far. The Purchasing Managers' Index, an early indicator of manufacturing activity, contracted for a seventh straight month in January. 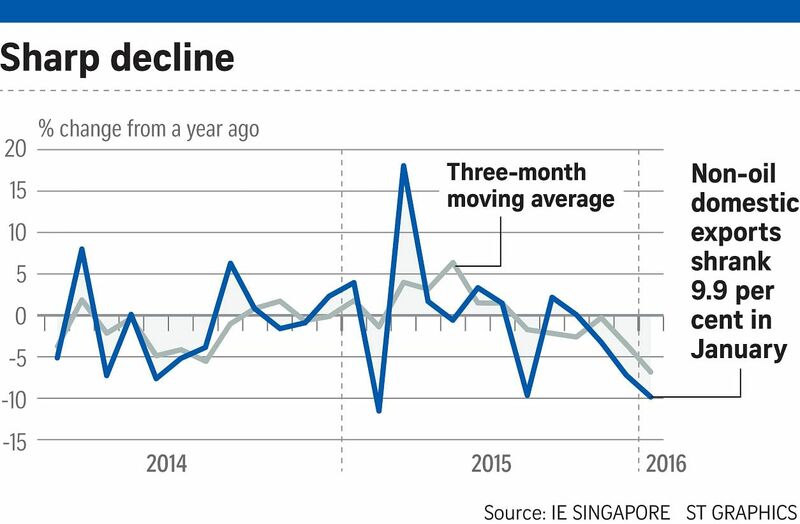 Capped with weak loan growth, a poor fourth-quarter jobs report last month and signs of more layoffs to come after the Chinese New Year, yesterday's weak trade data confirmed the risk that Singapore may be headed for a recession this year, economists said. Singapore releases its gross domestic product for the fourth quarter and the full year of 2015 next week. While that figure looks set to stay in positive territory, economists are not so certain about the quarters to come.